Yara Shahidi strikes a pose on the red carpet at the 2019 NAACP Image Awards on Saturday (March 30) at the Dolby Theatre in Los Angeles. The 19-year-old actress sparkled in a black and white dress as she was joined at the event by her black-ish co-stars Marsai Martin, Miles Brown, and Marcus Scribner along with her grown-ish cast mates Francia Raisa, Trevor Jackson, and Chloe X Halle. The cast of This Is Us poses for photos in the press room with their trophies after winning at the 2019 Screen Actors Guild Awards held at the Shrine Auditorium on Sunday (January 27) in Los Angeles. The actors won the award for Outstanding Performance by an Ensemble in a Drama Series, beating out the casts of The Americans, Better Call Saul, The Handmaid’s Tale, and Ozark. 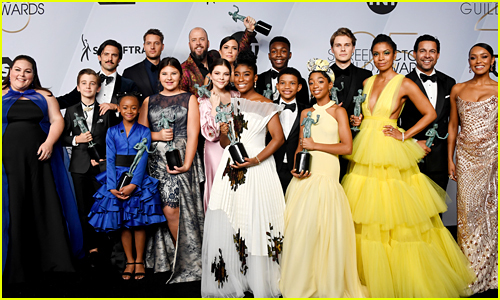 Mandy Moore, Milo Ventimiglia, Sterling K. Brown, Chrissy Metz, Justin Hartley, Susan Kelechi Watson, Chris Sullivan, Melanie Liburd, Jon Huertas, and all of the young kids from the show stepped out on stage to accept the award. This is the second year in a row that they have won! 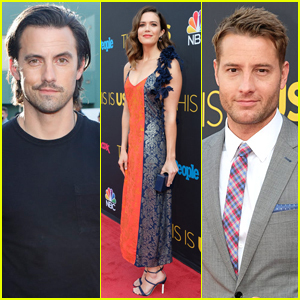 Mandy Moore Joins Milo Ventimiglia & Sterling K. Brown at 'This Is Us' Season 3 Premiere! Mandy Moore and Milo Ventimiglia pose for photos on the red carpet as they arrive at the season three premiere of This Is Us on Tuesday night (September 25) at the Paramount Theatre in Los Angeles. The 34-year-old actress looked pretty in a red and black gown while the 41-year-old actor looked buff in a black T-shirt and jeans for the premiere of their hit show. 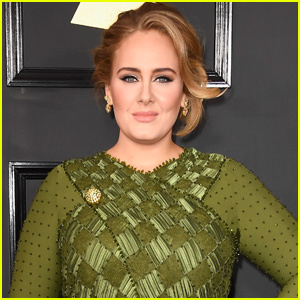 Joining the on-screen couple on the red carpet were their co-stars Chrissy Metz, Sterling K. Brown, Susan Kelechi Watson, Chris Sullivan and wife Rachel Reichard, and Jon Huertas. Younger stars of the show including Lonnie Chavis, Hannah Zeile, Logan Shroyer, Eris Baker, Mackenzie, Hancsicsak, Faithe Herman, Parker Bates, Niles Fitch, and Lyric Ross also stepped out for the event. This Is Us airs on Tuesday nights at 9/8c on NBC. FYI: Mandy is wearing an Azzedine Alaia dress. Sterling is wearing a Theory suit and shirt along with Rob McAllen shoes. Chrissy is wearing a custom Eloquii dress, Stuart Weitzman shoes, Atelier Swarovski earrings, and a Narcisa Pheres ring while carrying a Stuart Weitzman clutch. Skylan Brooks, Mandy Moore, Miya Cech, and Amandla Stenberg team up for a screening of their new movie The Darkest Minds! 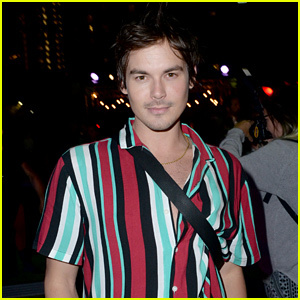 The co-stars stepped out for the event held at ArcLight Hollywood on Thursday (July 26) in Hollywood. They were joined by their other castmates Mark O’Brien, Wallace Langham, Golden Brooks, Peyton Wich, Lidya Jewett, Sammi Rotibi, McCarrie McCausland, director Jennifer Yuh Nelson, and Alexandra Bracken, who wrote the novel the film is based on. Mandy‘s This Is Us co-stars Mackenzie Hancsicsak and Lonnie Chavis also stepped out to show their support, as well as Chloe Lukasiak, Aliyah Moulden, Brec Bassinger, and her boyfriend Dylan Summerall. In The Darkest Minds, imprisoned by an adult world that now fears everyone under 18, a group of teens form a resistance group to fight back and reclaim control of their future. Watch the trailer here, and don’t miss it when it hits theaters on August 3! FYI: Mandy is wearing Carolina Herrera. Amandla is wearing Mulberry. 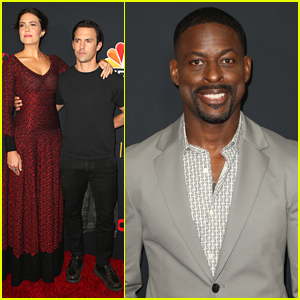 Milo Ventimiglia looks buff in a black T-shirt as he attends the This Is Us Season 2 Premiere Event on Tuesday (September 26) at Neuehouse Hollywood in Los Angeles. 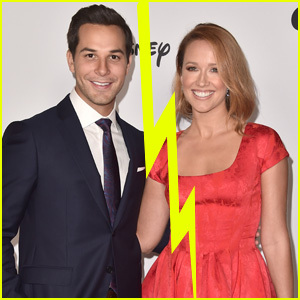 The 40-year-old actor was joined on the red carpet by his TV wife Mandy Moore along with fellow co-stars Justin Hartley, Chrissy Metz, Susan Kelechi Watson, Chris Sullivan, and Alexandra Breckenridge. CHECK OUT: This Is Us Season 1 Finale Recap – Refresh Your Memory Before Tonight! The younger stars of the show including Hannah Zeile, Niles Fitch, Mackenzie Hancsicsak, Logan Shroyer, Parker Bates, Eris Baker, Lonnie Chavis, and Faithe Herman also arrived in style for the event. During tonight’s premiere, Justin‘s character basically predicted all of the Kardashians’ pregnancies! FYI: Chrissy is wearing a custom Kiyonna dress, Stuart Weitzman shoes, and Swarovski Atelier jewelry while carrying a Les Petits Joueurs clutch. Mandy is wearing a Rosie Assoulin dress, Sophia Webster shoes, and Peter Pilotto for Swarovski jewelry with an Edie Parker clutch. Milo Ventimiglia Goes Retro for 'This Is Us' Halloween Episode! 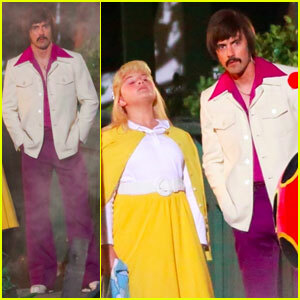 Milo Ventimiglia is rocking a retro look while filming the This Is Us Halloween episode! The 40-year-old actor was seen on the set in character as Jack Pearson while taking his kids trick-or-treating. It appears as if Mackenzie Hancsicsak was filming with him for the special episode on Saturday (September 16) in Los Angeles. Mackenzie plays a younger version of Chrissy Metz‘s character.